Heart Rate Training is the definitive resource for the competitive athlete or weekend warrior who wants to incorporate a scientific method for improving his/her aerobic capacity. Recommended for: Elite athletes, serious weekend warriors, specifically, those who compete in aerobic activities. • Roy Benson, MPE, CFI is the owner and president of Running, LTD, a company that has operated Nike-sponsored summer camps for adults and high school runners since 1973. He has coached professionally for over 40 years in military, club, collegiate, and high school teams. From 1993 to 2008, his boys' and girls' cross-country teams at Marist High School in Atlanta, Georgia, won a total of 16 state championships, and his cross-country and track runners won 21 individual state titles. Benson has been a competitive runner himself for more than 40 years. • Declan Connolly, PhD, FACSM, CSCS is a professor and exercise physiologist at the University of Vermont where he is the director of the Human Performance Laboratory. He has more than 300 scientific publications. As a boy in his native Ireland, he was an elite cyclist, and held several national championships. His web site is: www.VermontFit.com. The premise of this book is that training must be individualized and that can only be accomplished by monitoring an athlete's heart rate during training. Doing so (by using a heart rate monitor) allows the principles of exercise physiology to be applied in a logical and scientific manner. "Lower-intensity, aerobic work at heart rates lower than 75% max-HR induces cardiovascular and body composition changes, whereas higher-intensity, anaerobic work at heart rates greater than 80% induces more neural, respiratory, and biochemical changes." In other words, you need to incorporate both types of training to get maximum results. 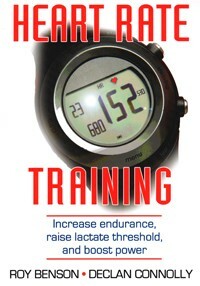 Chapters 1 and 2 explain the basis for using heart rate to design a training regimen. These chapters are well done. Pages 11-18 provide an excellent discussion of the relationship between exercise heart rate and VO2.....the best I have read. In chapter 2, the authors point out that, while age is the dominant factor that affects maximum heart rate, the commonly-used equation "220 - age" is a very unreliable way to determine max HR. The only way to obtain a truly reliable max HR measurement is for a person to perform an "all out effort" exercise test. Once this value is determined, then the specific ranges of exercise intensities can be calculated. In chapter 5, the authors introduce the term "heart rate fartlek" which, of course, is derived from the Swedish term "fartlek" which means "speed play." An example of a 20-min heart rate fartlek workout is when the athlete adjusts their exercise intensity to push their HR up to 75% of max, and then eases off to let it drop back down to 60% of max (p. 59). These are the training principles presented. The 2nd-half of the book employs these principles in various sports settings, making this book a highly-practical guide. • Photos & Illustrations: The black-and-white photos are appropriate. No illustrations are provided. • Tables & Graphs: There are plenty of tables in this book and they are generally well done. The handful of graphs are also done well. • Documentation / Accuracy: This book is not heavily referenced, but that does not detract from its credibility. The Index at the end is good. • What I Liked: The writing style is excellent; complex physiologic concepts are explained in a clear and easy-to-understand way. The reader can easily utilize specific HR ranges in designing training regimens. • What Could Be Better: Everything about this book is done well. However, the authors use labels for 4 phases of exercise intensity that I felt were confusing: "endurance," "stamina," "economy," and "speed," going from low to high intensity. ("Economy" doesn't sound like the best way to describe exercise intensity at 85-95% of maximum heart rate!) These terms are first introduced on p. 4-5. However, on p. 6, the terms "easy," "moderate," "difficult," and "very hard" are used. Then, on p. 145, the authors go back to the endurance/stamina/economy/speed labels, but, then, assign the abbreviations "EZ / MO / FA / VF" respectively. "FA" is supposed to stand for "economy"?? ?.....sorry, but I'm confused. Quite honestly, this is the best training / exercise physiology book I have read. Even though complex exercise physiology concepts are presented, the authors discuss them in a manner that any athlete (or coach) can understand. 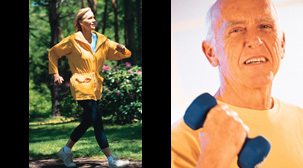 Training strategies are tied to specific ranges of heart rates. This "scientific approach" to training is easily understood and applied. This book achieves the goal implied by the title. I can recommend it highly.